09 Jul 2018 --- Multi-Color Corporation (MCC) and Talkin’ Things are the first Internet of Things (IoT) packaging platform providers to combine Augmented Reality (AR) and Near Field Communication (NFC) technology to create a “unique” customer experience in connected products, according to Talkin’ Things. 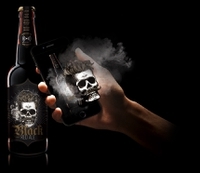 The label of Black Red Ale beer, which incorporates a large “talking” skull, fully fits into the smart packaging trend by using advanced AR facial recognition and dynamic scenarios dependent on users’ emotions. NRC is a set of communication protocols that enables two electronic devices, one of which is often a portable smartphone, to establish communication and AR is the interactive experience of a real-world environment, which has been “augmented” digitally. Click to EnlargeAs the customer scans the smart label with a mobile app, the skull presented on the label engages in an interactive dialogue with the consumer. The facial recognition feature detects if the customer is happy or sad and customizes the next part of the dialogue to accommodate a flowing conversation. Furthermore, variable AR scenarios are also launched depending on answers provided to questions asked by the skull. “Thanks to our labeling production capabilities and Talkin’ Things technology combined with creative services, we are able to offer our clients a brand new solution that will completely transform a product and change the way end-customers interact with it,” says Craig Miller, President of NA CPG at Multi-Color. Additionally, NFC smart label applied to the bottle’s neck provides a proof of purchase solution for 2-stage communication with end-customers. It recognizes when the product has been opened to provide different messages to the customers. Talkin’ Things is a company that “transforms traditional products using digital technology.” The use of digital technology in the packaging sector is booming, with interactive, digitalized labels popping up in all sections of the grocery aisles. IoT and packaging technology are expected to continue connecting for enhanced customer experience as well as food safety. The NFC used by the Black beer brand demonstrates a potential move away from the use of QR codes that have been used by brands for years. 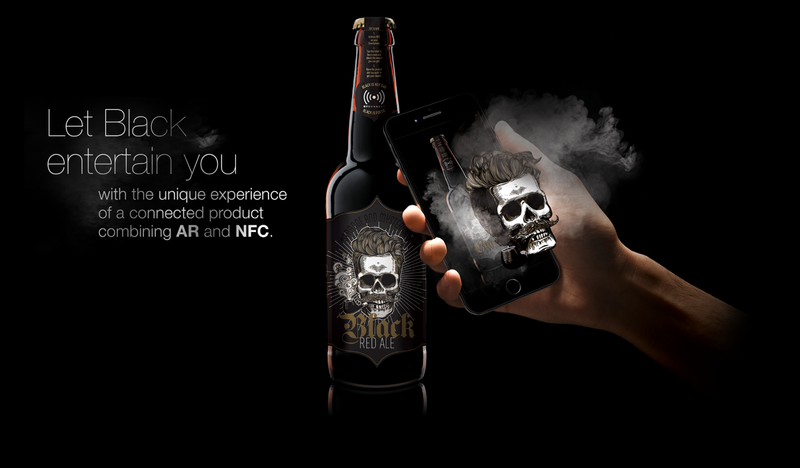 NFC as integrated into packaging, such as on the Black beer bottle, makes it even easier for consumers to access the digital aspect of the packaging and offers a richer experience. “I think that the cost of this technology will decrease so much that you will see the Unilevers and Nestlés, who have low priced goods with smaller profit margins, using NFC globally across their brands,” says Worth. “Right now consumer awareness of what to engage with and why is still at an early stage, but the more brands that are coming to market with connected packaging programs the greater the consumer awareness of the technology will be,” he adds. FoodIngredientsFirst has previously reported on the tequila brand, Jimador, which also uses NFC in its digital marketing labels. Jimador enhanced its summer soccer marketing scheme with “smart” bottles and “connected” coasters, in collaboration with Thinfilm. The digitalization of taste has even taken the subjective world of flavor by storm with the digitizing of taste and sensory communications to reduce cost and increase efficiency for supplier and formulators.